to keep baseline risks within the acceptable range. The Group has adopted a three-tier risk management approach to identify, assess, mitigate and handle risks. At the first line of defense, business units are responsible for identifying, assessing and monitoring risks associated with each business or deal. The management, as the second line of defense, defines rule sets and models, provide technical support, develops new systems and oversees portfolio management. It ensures risks are within the acceptable range and that the first line of defense is effective. As the final line of defense, the internal audit department ensures that the first and second lines of defense are effective through constant inspection and monitoring. 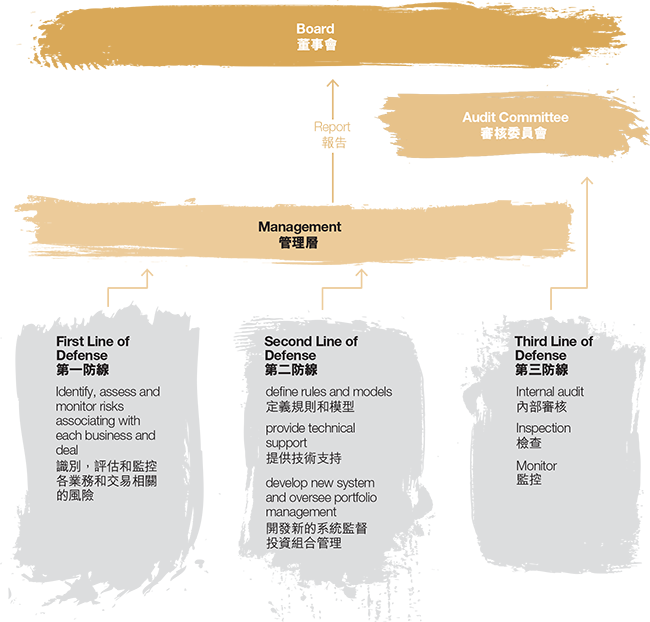 Our internal control systems are developed with reference to the Committee of Sponsoring Organizations of the Treadway Commission principles which involved five elements as internal environment, risk assessment, control activities, information and communication and internal supervision. 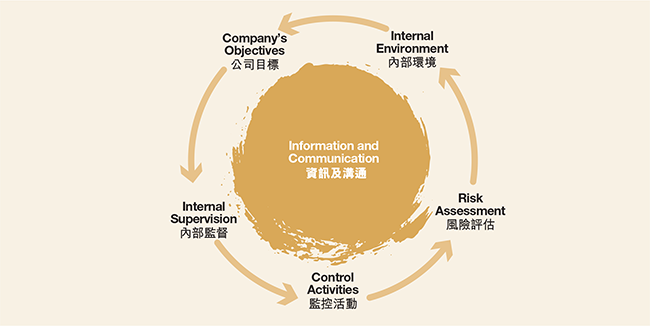 The aim of internal control is to reasonably guarantee the compliance of its operation and management with regulations and laws, assets security, and authenticity and integrity of financial report and related information, improve the efficiency and effect of operating activities and promote the realization of development strategy of the Group. The Group's revenue is mainly derived from customers from PRC. The Group is exposed to the risks associated with the PRC market which include the risks of policy change, interest rate change, demandsupply imbalance and the overall economic conditions. The market risks may pose an adverse impact on the Group's business, financial condition or results of operations. The project team will carefully scrutinize each project for related risks and returns. These include assessment of relevant government policies, market demand and conditions and economic data. The management is responsible for supervision, conducting regular operation reviews and keeping the Board fully informed through regular reports, and prompt decisions can therefore be made if changes are required. Distinctive risks factors in property related businesses such as default of buyers, tenants and strategic business partners, and inadequacies or failures of internal processes, people and systems may have different levels of negative impact on the results of the Group's operation. Industrial accidents may happen although precautionary measures is established, which may damage the Company's reputation or cause financial loss to the Group. The internal audit team will reviews key activities of the Group and ensures all material controls, including financial and operational, are functioning effectively. Precautionary and contingency measures are also set up to ensure the Group is protected against major potential loss, damage or impact to our operations. Insurance coverage against accidental losses and/or other hazards is used in protecting our assets and reputation against any potential liabilities. The investment and business operation are exposed to risks from exchange rates, interest rates and liquidity. Amid global financial uncertainties, the financial risks encountered by the Group had increased accordingly. The Group closely monitors the financial risks and when appropriate will adopt measures to manage and hedge corresponding risks by using of derivatives such as interest rate and currency swaps. The Group's cash and financing are centrally managed and controlled at the corporate level to achieve a better borrowing terms and coherent financial risk management. To meet our obligations as and when needed, the Group maintains sufficient facilities with various banks and financial institutions. The maturity of deposits and loans is carefully planned and managed to reduce liquidity risk. Talent shortage and high employee turnover will have a negative impact on the Group's present and future performance. We believe that human resources are of critical importance for the success of the Company. To attract, motivate and retain talented employees, the Group evaluate our employee remuneration packages and monitor them against market trends. We provide on-the-job training for new staff and offer career advancement opportunities for suitable staff to develop their full potential at various stages of their career. We also encourage communication with all levels of staff to gather feedback and suggestions for future improvement.